"We want to understand that ability of trees to rebound from things, even some things that look somewhat devastating"
The sparkling ice spread through a small stand of trees in the White Mountain National Forest so precisely, it could have been applied by Elsa, Disney's "Frozen" queen. Within the basketball court-size plot, everything glistened. Outside it, branches were bare. But there's no magic going on at the Hubbard Brook Experimental Forest, just lots of science. Operated by the USDA Forest Service since 1955, the site is now home to a research project to examine the impact of ice storms, the often beautiful but devastating weather events that reshape forests, damage infrastructure and disrupt lives. The goal is to study how the storms affect the forest and the wildlife that depends on it, and eventually, model the timing and location of future storms. "People are very concerned about ice storms because they have a huge impact, but we know almost nothing about them," said Charles Driscoll, one of the project's researchers and a professor of environmental systems engineering at Syracuse University. "This is a way we can try to investigate this under a controlled situation, where we can look at different levels of icing and then see what the variable response is to and across an ecosystem." In the U.S., ice storms are prevalent in a belt from east Texas to New England, with the greatest risk in the Northeast. In 1998, one such storm left millions of people without power and caused more than $4 billion in economic damage. More than a decade later, Forest Service research ecologist Lindsey Rustad was driving through the Berkshires watching cars slide off an icy road and thought, "This is something we really need to know more about." While her first impulse was to become a storm chaser, following and measuring the effects of ice storms after they hit, Rustad and a colleague came up with a better idea. "We put on our thinking caps again and then we said, 'We both work in one of the most famous outdoor laboratories in the world. 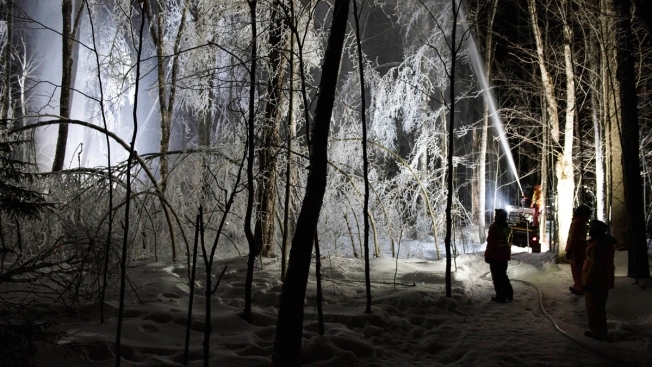 So instead of going to ice storms, or waiting for an ice storm to come to us, we decided we would make ice storms," said Rustad, one of the lead investigators on the project. That's exactly what happened one night last week. Fire hoses drawing water from the brook were mounted onto a pair ATVs that traveled the length of two research plots, spraying a fine mist into the air. Researchers used bright orange buckets to keep track of how much water was applied and gray laundry baskets to catch debris falling from the trees. "The cool thing is that trees are big, strong, long-lived organisms that have to endure all kinds of stresses. They can't run away, they may be alive for hundreds and hundreds of years, so if something bad comes, they should be able to rebound," said Paul Schaberg, a plant physiologist with the U.S. Forest Service. "So we want to understand that ability of trees to rebound from things, even some things that look somewhat devastating." The multi-year project is funded by the National Science Foundation and brings together scientists and others from half a dozen universities, including the University of Vermont, the University of Southern Maine, Cornell University and Texas Tech University. Some of the 10 research plots were iced last year and again last week to test the effects of repeated storms, while some plots are left alone as the control group. While there is some speculation that the "ice belt" may shift northward due to climate change, or that ice storms may become more frequent, the jury's still out, Rustad said. "That's part of the project â to try to understand the climate and try to understand if we might expect more of these," said Rustad. "We don't know that yet, but we need people to be more proactive rather than reactive in the face of these really devastating winter weather events."